The Problem: This whole effort has been driven by the math problems in DOSbox. 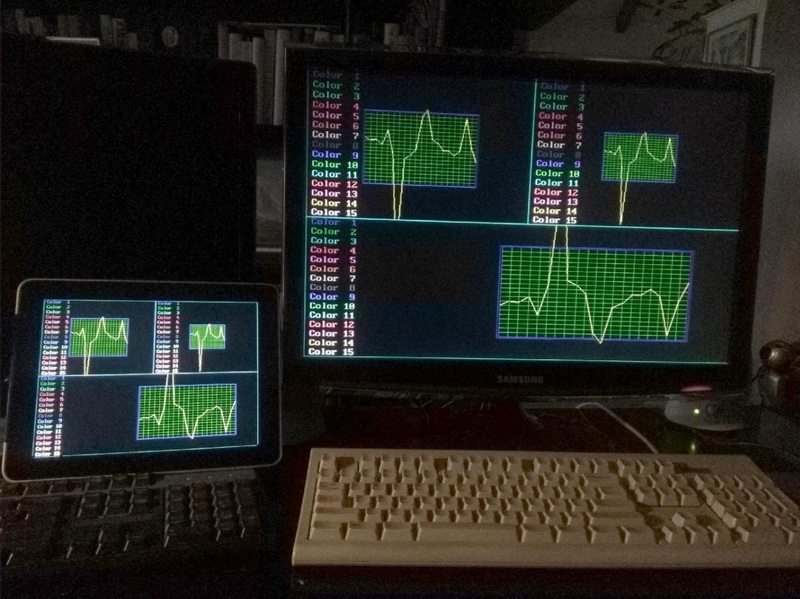 I fixed these on my first Blackberry Playbook version, and then later, on my Android gDOSbox stuff, and the GNUplot37 and APL's that I put up on the Google Play Store. But DOSpad, the DOSbox inplementation on my hacked iPad has math problems. I had to use a hacked/jailbroken iPad, since Apple iStore does *not* allow any programming languages or interpreters, and locks you into the "sandbox" where you cannot even save your own files to your own device. 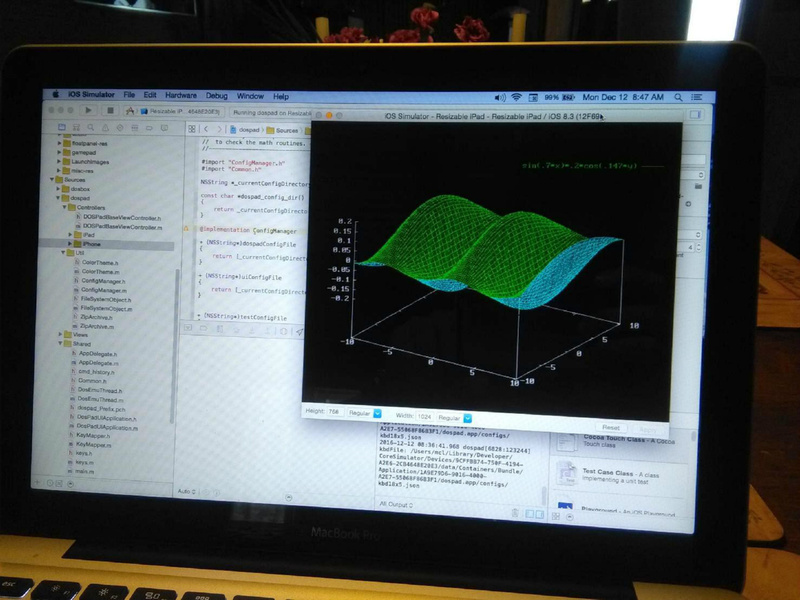 The essense of the problem is shown in pic on screen right - the "Math Overflow Error" in a simple Fortran program that calculates sine using a Taylor series. And it gets worse in GNUplot, with crazy number values appearing on the axis of graphs. On the iPad1, running DOSpad, the math fails. 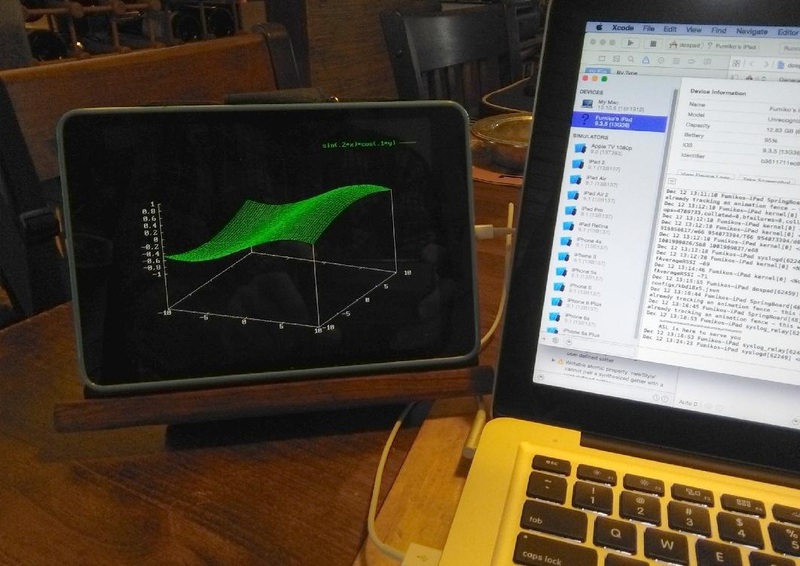 But running my repaired version (DOSpad Math) in an Xcode iPad device simulator, the same program calculates correctly. I managed to get a further modified DOSbox running on the iPad 1, which I call the DOSPAD-Gsys version of the DOSBOX code, which includes the math-fixes. As a test, and to see if it could support some real work, I put an original Fortran compiler on the iPad. I deployed the entire IBM/Microsoft Fortran 5.1 *compiler* (not just the running programs) from a Windows box to the iPad-1 application data area, and got it to work. This was again, non-trivial. With Fortran 5.1, you can do absolutely anything. This approach works. It means NO MORE annoying "Killed 9" issue like I get running native code on the restrictive and deliberately crippled Apple iOS operating system. Since the iPad was jailbroken (and I had root access), I was able to drop the Fortran 5.1 compiler into the application data area for the DOSPAD-Gsys app. This is key. You have to use "root" and the Linux/Unix utilities to change the protections, so that the compiler can actually create files on the fly, it needs to run. The Apple "Sandbox" restrictions work hard to prevent you actually doing anything useful with iPad, but once jailbroken, you can bypass a lot of this foolish nonsense. You can use the iPad, like a real computer. root access to the iPad. can be sufficiently accurate for financial and scientific purposes. 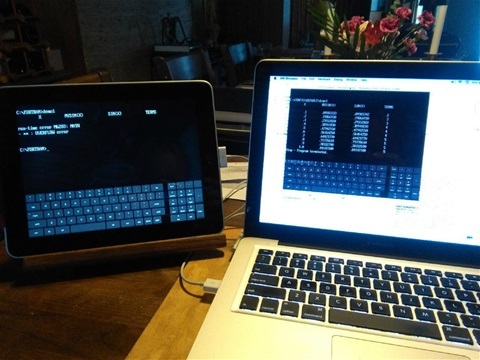 1) Log into the iPad from your Windows or Linux box, using "ssh". The "ssh" program stands for "secure shell". 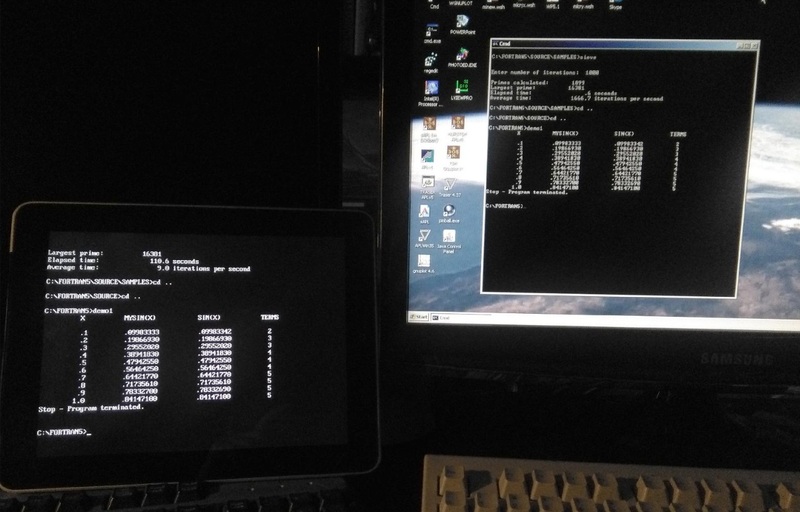 "ssh" and "scp" programs on your Windows box. 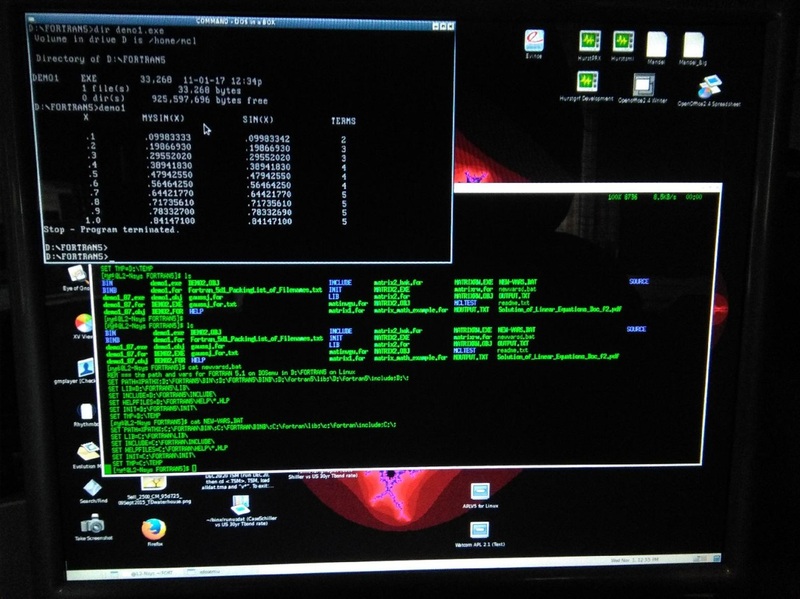 ssh and scp to the Windows XP/SP3 box (hpxp) was not working initially, even from Linux boxes. Now fixed. I had stopped some network services on Windows, probably why. Had to reboot to fix. in front of files on e: disk. the WindowsXP/SP3 box, to get the sshd stuff working right for Windows-32 OpenSSH7. runs all original Fortran-5.1 programs that run in Windows "Cmd" shell. In Linux (CentOS and Fedora), you use DOSemu to run the Fortran files and compiler. On Windows, you can use either Windows DOSbox, or the Windows "Cmd" shell to run Fortran-built .EXE files. correctly, and yielding consistant, self-similar results across all platforms. On thie iPad, I put the Fortran compiler into directory called: FORTRAN5 on virtual C:\ disk, so I need to run this file below. fail with a file-write error. C This function evaluates the factorial of the integer argument. Got it! 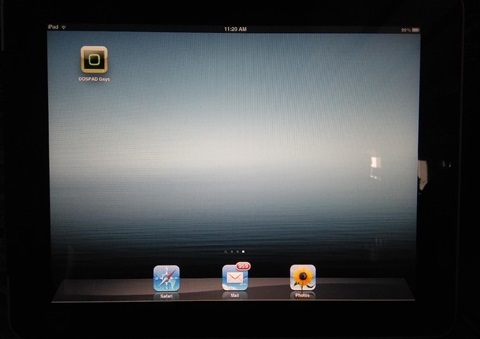 Got DOSPAD-Gsys on the iPad 1 working right. This is the original IBM/Microsoft Fortran 5.1 Compiler and built-programs (as .EXE files) running on an iPad 1 (first generation), and on a WIndows-XP/SP3 box, inside a standard Windows "Cmd" shell. The "demo1" program works, which calculates sine, and so does the "Sieve of Eratosthenes", a process for determining prime numbers. The graphics programs built using Fortran5 also run correctly on both machines. This is a program called "REALG.FOR", running on iPad under DOSPAD-Gsys, and on a Windows box on the right, using the standard "Cmd" shell. It calculates real numbers, and displays them as graphics. It is a test program included in the /FORTRAN/SOURCE/SAMPLES directory of the original Fortran 5.1 compiler, offered by both IBM and Microsoft, back in the early 1990's, for MS-DOS and OS/2. This is a full-featured, commercial-quality compiler, which can still be used to do useful calculations. I have a matrix inversion program, and a program for matrix multiplication, which can thus be used to evalute the tensors generated by a neural-network. You can basically take the results of your NN-AI, and drop them onto the iPad, and evaluated a data-block, sourced from data harvested from the internet. Note that you can *run the compiler* on the iPad, and create working programs, without the resorting to the complex toolsets and program development environments required to construct and deploy modern iOS "apps". Note: I have Python 2.7 also running on this iPad, but getting it to load the useful libraries (ie. NUMPY and such) proves to be problematic. The Python NUMPY library is simply the original IMSL routines - which are very useful, debugged, mathematically correct programs - and were all written in Fortran. I expect to be able to use those here, using this original Fortran 5.1 compiler. 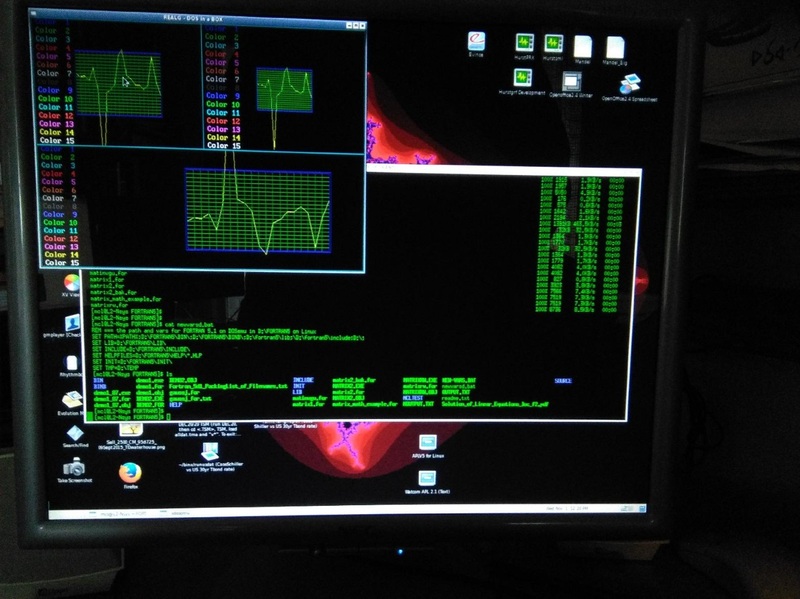 DOSemu running the REALG.FOR Fortran 5.1 under DOSemu on CentOS 6.6 Linux. Works good. Running the Microsoft Fortran 5.1 test program, "DEMO1.FOR" in DOSemu, on CentOS 6.6 Linux. Also works correctly, using both single and double precision REALs.